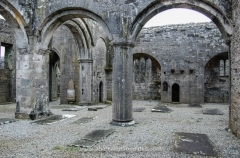 The site is on the shore of Killala Bay and should be visited in conjunction with the neighbouring Third Order friary of Rosserk. Remains: church, chapels, tower and friary are practically complete. 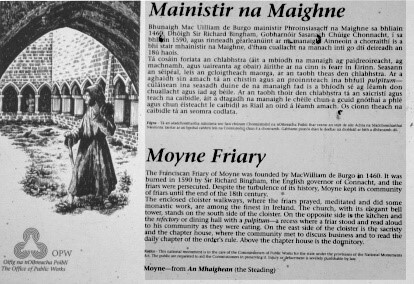 Moyne was the first proper foundation of the Observant friars in 1460, although it had been built a few years before (see Chapter 3). The de Burgos were the major patrons and the church was consecrated in 1462. Building continued for another fifty years. By this time Moyne had become a student house and had a community of about fifty. Typical of a friary in an Irish area, it escaped early suppression. Despite problems in 1578-9, the building was not destroyed nor the community dispersed until it was raided by Sir Richard Bingham in 1590. 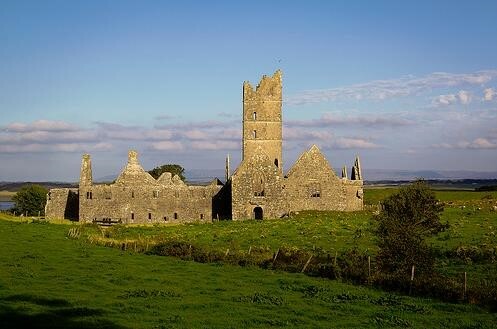 About six friars remained and they were able to re-open a formal residence in 1618. There they lived for the rest of the century, except during 1550-8. 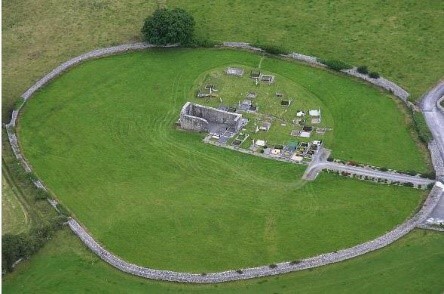 After the efforts to expel the religious from Ireland in 1697, the friars seem to have moved to Kilmacshalgan (Co. Sligo), at least for a while, and became involved in parish work. The community of six in 1744 was reduced to two by 1771 and the last friar of Moyne, Fr Thomas Burke, died in 1800. The friars considered returning to the area in 1913.